Unbelievably delicious plant-based food. Unadulterated. Uncooked. 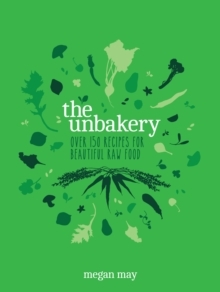 The Unbakery is a treasure trove of more than 150 ideas for raw plant-based food so yummy you won't miss that it's not cooked. From Mexican Tacos with Chimichurri and Salsa to a heavenly - and yes, good for you! - Blueberry Cheesecake, here are inspirational recipes for incorporating more fresh fruit and vegetables into your diet. All recipes are free from gluten, dairy and cane sugar; all are achievable, unfussy and seriously delicious. Get back to nature and enjoy beautiful plant-based food, uncooked. Megan May is the chef/owner of award-winning Auckland cafes Little Bird Organics and The Unbakery.